A mixed-media installation called “Cash Crop” has found a temporary home in Guilford College’s Art Gallery. The award-winning installation is the work of Stephen Hayes, a recent graduate of Savannah College of Art & Design and a native of Durham. Inspired by a desire to “tie together the past and the present,” Hayes’ art brings history to life in a manner that is both provocative and educational. “We were taught about slavery, but [our education did not] address the extent to which people were considered goods and shipped to different ports as commodities as items, rather than human beings,” Hayes explained in a phone interview. 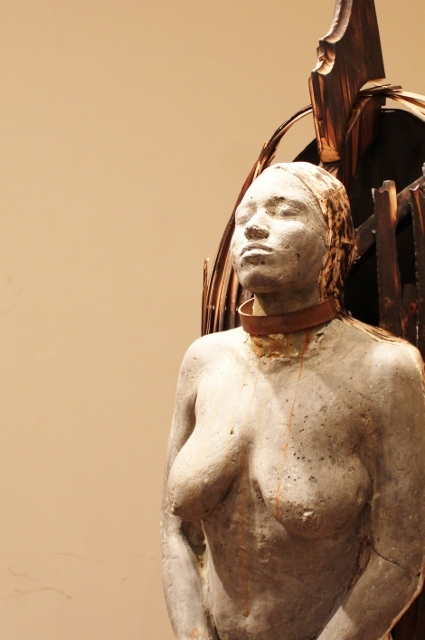 The installation features fifteen life-sized figures fashioned from wood and cement. Viewers are encouraged to walk among the statues, all of which are connected by a chain to a pallet in the middle of the floor. This year marks the 50th anniversary of the college enrolling its first African-American student. Hammond hopes that in bringing the exhibit to Guilford, it prompts dialogue about the connection between United States’ history and its impact on modern understandings of race. Hayes explains that the significance of Cash Crop extends beyond the narrative of the United States’ slave trade. “[There is a parallel between] the Brookes’ slave ship plan and the cramped quarters of sweatshops in third world countries,” he said. He hopes that Cash Crop will encourage viewers to engage in discussions about both past and present forms of enslavement. To join the conversation, visit the Guilford College Art Gallery on Friday, September 7th from 6:30-7:00 PM for a “Meet the Creator” reception with Hayes, open to all. He is right about one thing. There are so many people who don’t know history. So let’s look at the “United States” slave trade. On March 22, 1794, Congress passed the Slave Trade Act of 1794 (6 years after the ratification of the U.S. Constiution) that prohibited making, loading, outfitting, equipping, or dispatching of any ship to be used in the trade of slaves. Although the international slave trade was allowed until 1808 (20 years after the ratification of the U.S. Constitution), Congress prohibited it on January 1, 1808, the first day it was permitted to do so. It seems that the Constitutional Convention provided a direct and obvious pathway to outlaw the “United States” slave trade with a grace period. All 6 years of it. Or 13 if you start after the ratification of the Articles. The “United States,” from her founding, planned to and did outlaw the importation and exportation of slaves. Though the importation of slaves is a crime against humanity, no matter how short the period, using it as a political tool to trash your own country is just plain distasteful. And all in the name of “history.” A history of which there is claimed to be a “US slave trade.” This exhibit would have us believe that the slave trade ended only after the Civil War and I wouldn’t be surprised if this champion of history thought this to be true. Hello John! Thanks for taking the time to share your thoughts. We at Guilco SoJo don’t believe that this artist created this piece in an attempt to “trash” the United States nor manipulate history. As Americans, we have the duty to examine and engage with our past, even the parts that we aren’t incredibly proud of — this exhibit is a representation of the transatlantic slave trade, but it is also designed to prompt viewers to think about slavery that continued even after the Act Prohibiting the Importation of Slaves was passed, including modern forms of slavery. 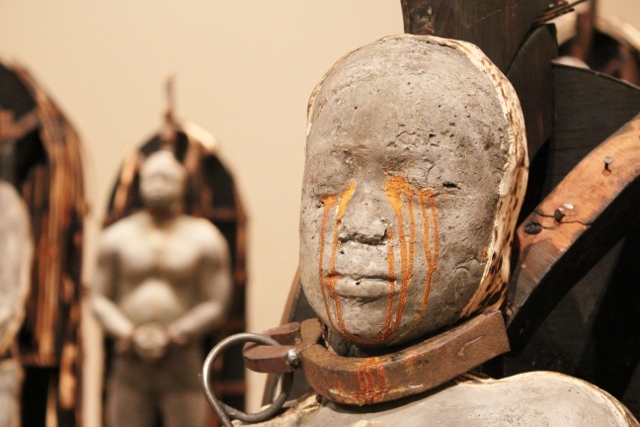 Nowhere in the exhibit does it suggest that the slave trade was in existence until the Civil War. The government called for an end to importation of slaves into the States in 1807, but humans were still being treated as commodities well after this legislation in the US was passed, both domestically and internationally. Describing the exhibit Hayes speaks of the slaves transported from 1540-1850. The article above speaks of how “Cash Crop extends beyond the narrative of the United States’ slave trade.” Not the Trans-Atlantic slave trade. In fact, not once is the Trans-Atlantic Slave trade mentioned in the above article, though there are two mentions of the United States. The palate has, (and this is important), the Seal of the United States of America with chains leading to “15,000,000” bound and shackled slaves transported by ship. Direct United States participation of the Slave trade was outlawed 6 years after the ratification of the U.S. Constitution. In other words, there were only six years after the formation of the United States as we know it today when a slave ship could legally sail under a U.S. flag, illegal smugglers aside. The importation of slaves was outlawed the first year allowed by the U.S. Constitution, 20 years after ratification. The major violators of history do one of two things. They either misrepresent history or they purposely leave the facts out. In this case, whether done by accident or not, both were achieved between this rather impressive form of art and the above article. You may argue that it’s not meant to trash the United States, but a representation of 15 million slaves by transport chained to the Seal of the United States rings loud and clear. Very loud indeed. I agree that we need to examine our past to include the parts we are not proud of. There is plenty to pick from in that regard. However, I firmly disagree of the extreme over exaggeration and misrepresentation that moves the discussion beyond honest history and toward trashing a country where it is largely not due. I have visited this impressive exhibit a few times during recent weeks, and I am inclined to agree with John that the article misrepresents historical facts. Yes, the international slave trade did legally continue in the U.S. until 1808 (and officials often turned a blind eye toward smugglers in the following years). The United States also participated in a “domestic” slave trade until its abolition, horrifically breeding children as chattel and separating families. Along these lines, John made a very astute observation of the ahistorical description of the exhibit in this article, distinguishing between transatlantic and domestic slave-trading practices. To be clear, though, this problem arises out of the article, and not, as far as I have seen, the actual exhibit or the artist’s own words. Both references to the “United States” slave trade are the words of the article’s author, as far as I can tell. I have also not seen this inaccuracy at the exhibit itself. The slipperiness of history in the article should in no way undermine the integrity of the exhibit. As a teacher, I see this inaccuracy (presumably accidental) not as any intentional form of “trashing,” but as evidence of the same anachronistic view of history expressed by my students when they assert, for example, that the Pilgrims settled “our country.” To them, the United States has always been here, forgetting the political and intellectual transformations that birthed it (and the modern ‘nation’ more generally) in a specific historical context. Nonetheless, I appreciate both the article for discussing this important work of art, and John’s attention to detail to assure that we don’t play fast and loose with a very complex history that deserves our utmost attention. Art, like poetry, is often left up to the interpretation of the observer. Art often portrays stories with no beginning or end. Most art has obvious hints accompanied by more subtle ones. They are puzzles for the observer to assemble. Most art allows for interpretation to be boundless and most observers will never read that much in to it. As for the boundless interpretation, I will leave it to the observers. The obvious ones include a depiction of slaves, shackled and bound. Many will die before reaching their destination. They strike fear in the hearts of any conscious person who looks upon their horror and imagines themselves in their place. They lay against the ships, packed like the crate they’re chained to. The crate bears the seal of the United States, the obvious villain in this piece for the less historically inclined. Finally the number, of which, is much less obvious. Numbers have meaning, though, unless the observer is caught up to speed on American history, he/she will fail to catch it. Fifteen slaves by fifteen ships, one for every estimated million transported in the Trans-Atlantic Slave Trade, a total of 15,000,000 humans treated as though they were cattle. Now let’s piece it together at face value, without the artists explanation, claimed artistic intention, or travelling to the realm of boundless interpretation. All, that’s 100%, of the estimated fifteen million slaves involved in the entire history of the Trans-Atlantic Slave Trade bound and shackled directly to the Seal of the United States. A country of which directly participated in the trade for only six years after the ratification of the U.S. Constitution. A Country of which imported slaves for twenty years after the ratification of the U.S. Constitution, effectively outlawing it on the first day it was legal to do so. The capture and importation of slaves, indeed slavery itself, was inconsistent with the “Laws of nature and nature’s God” and the Constitution designed to defend those self-evident truths. After liberation from the British, the United States participated, both directly and indirectly, in the horrible act of trafficking slaves for 6% of the entire history of the Trans-Atlantic Slave Trade. Yet I see a representation of fifteen million slaves, the total estimate for the roughly 340 years of that particular trade’s existence, tied to our National Seal with no regard to the 38.5% of those transported by the Portuguese, the 18.4% to British America (Minus North America), the 17.5% to the Spanish Empire, the 13.6% to the French Americas, the 6.45% to British North America, the 3.25% to the English Americas, the 2.0% to the Dutch West Indies, and the 0.3% to the Danish West Indies. In fact, roughly 300,000 slaves were transported to the British Colonies that would become the United States and 300,000 after the creation of the United States, half of which were smuggled illegally. Once again, the exhibit displays a represented 15,000,000 slaves attached to the symbol of our nation, and our nation alone, the Seal of the United States. Though the relatively low number and feasibly immediate early banning of the slave trade in our national history doesn’t take away from the horrible act itself, it is certainly without a doubt, unjust, untrue, irresponsible, indeed it is historical and artistic malpractice, to chain a represented fifteen million bound and shackled slaves to the seal of the United States of America. It is certainly an act that goes beyond creating simply a conversation of our faulted past. Undeniably, there can be no other reason for such a gross and inaccurate exaggeration other than to trash, to discredit, to slander, to drag through the mud the name of the United States where it is absolutely not due. It is the equivalent of a historian writing a book and leaving out the context of history to drive a point home, whereas there wouldn’t be a point, or at least not the one he was trying to make, had he not left it out in the first place. Why would anyone do such a thing one may ask? I will leave that to those who want to travel to the realm of boundless interpretation. However, I will also assume soundness of mind, and therefore, absolve the artist of the excuse of historical apathy. Everything else I wrote above is just an observable conclusion of the “Cash Crops” obvious and subtitle hints, derived from looking at the art at face value within the context of history, and thereby realizing exactly what the message of the artist was. That message is: Just look at how evil this country is! Why present tense? Because people don’t change the past without pursuing a modern objective. Speaking of modern objectives, one might suppose that this is where “sweatshops” come in. No, that’s not shown in the art work at face value, obviously or subtly, without assistance from the artist or venturing in to the realm of boundless interpretation. At face value people will assess fifteen million slaves packed like crates by the evil United States of America. Furthermore, the message of “sweatshops,” ceases to justify bounding a representation of fifteen million African slaves, a gross exaggeration, to the Seal of the United States. Finally, the artist is quoted in the above article, “I don’t want it to be something they will have to research to get. I like to wow my audience and capture their attention on first glance, then build a conversation on what it is about. ” Of course, research will only reveal the veracity this statement, and a first glance, will only reveal a representation of fifteen million slaves bound to the seal of that evil country, the United States. Thanks for taking the time to continue this conversation, John. We appreciate your insight and fact-checking. 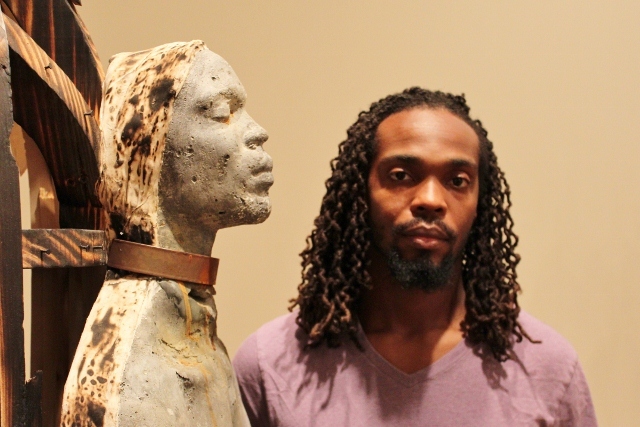 Perhaps Stephen Hayes would be interested in hearing your understanding of — and issues with — his art piece. Would you have felt more comfortable with the exhibit had the numbers been correct, or were the US seal not present? A representation of 15,000,000 slaves, traded over the Atlantic, bound and shackled to the Seal of the United States, a country that imported only 300,000 slaves (half of which were illegally smuggled), undermines any serious conversation intended by Mr. Hayes. It implies, no, it directly claims, by any reasonable and prudent persons interpretation, that the United States of America is responsible for the entire Trans Atlantic Slave Trade. It inflates the numbers and portrays a falsehood, effectively denying historical respect to those who shut the practice down in the United States, and the United States herself. My main issue with this piece is the palate with the U.S. Seal. Out of all the things that the U.S. has been guilty of, slavery, Indian displacement, Jim Crow, women’s rights, etc., 15,000,000 captured slaves traded over the Atlantic is certainly not one of them.